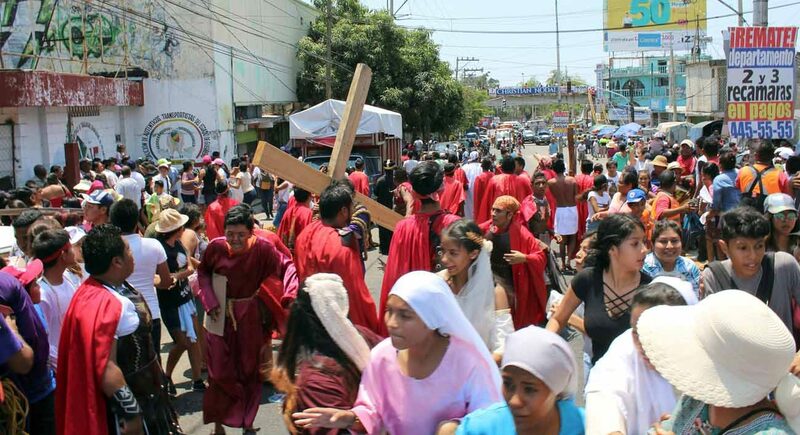 MEXICO CITY (CNS) — A pair of passion plays were interrupted by gunfire on Good Friday as the violence convulsing Mexico continued claiming lives through the Holy Week holidays. An annual procession in Acapulco was suspended March 30 after the sound of gunshots sent participants and spectators fleeing, according to local press reports. The Guerrero state government said police were chasing a trio of suspected car thieves, though local media say a conflict between criminal groups occurred and two people were killed. In the northern city of Reynosa, on the Texas border, a shootout also forced spectators and participants to seek safety. Videos circulating on social media showed the man portraying Christ stopping and squatting as shots rang out, then abandoning the cross he was carrying to hide behind parked vehicles. Mexico, where 83 percent of the population professes Catholicism, endured its most murderous year on record in 2017 with 29,158 homicides. The homicide rate in January and February was 21 percent higher than the same period last year. Several prelates spoke of the violence in their Good Friday homilies and on social media, but also the promise of change promoted by Christ’s crucifixion and resurrection. “How many widows, orphans and disappeared are there today? May we realize, brothers, that this is what sin generates,” said Bishop Raul Vera Lopez of Saltillo. “Easter is not only a liturgical celebration, rather above all, the effective change from inhumane, unjust situations to a peaceful and free life with equality. If Mexico does not overcome its terrible (human rights) crisis, it will continue suffering its Good Friday,” tweeted Father Alejandro Solalinde, an activist priest in Oaxaca state. The violence has especially hit the southern state of Guerrero, which includes Acapulco, as an estimated 15 drug cartels dispute the production, processing and trafficking of heroin. Two priests were murdered in Guerrero as they drove home from Candlemas celebrations in early February. Violence has hit such shocking levels that Bishop Salvador Rangel Mendoza of Chilpancingo-Chilapa has started seeking talks with criminal groups in Guerrero in an attempt to bring peace to his diocese. Acapulco still attracts throngs of tourists from all over Mexico during Holy Week, though press photos showed heavily armed soldiers patrolling the beaches.